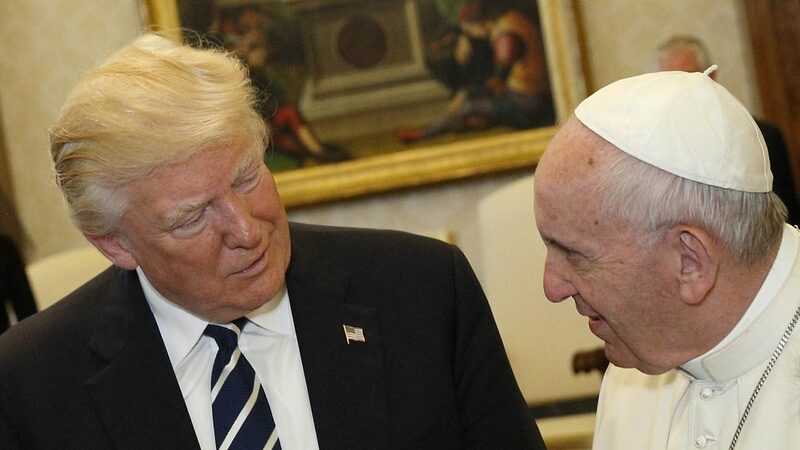 WASHINGTON (CNS) — Though there are few details about what was said when Pope Francis and Donald Trump talked privately May 24, much was made online about the U.S. president’s wide smile and the pope’s more serious stance as the two posed for public photos at the Vatican. The pope showed his trademark smile when he met the president’s accompanying family members — his wife, daughter and son-in-law — after their meeting, which was described as “cordial” by the Vatican. But away from the cameras, in the public arena of ideas about how the world should work, the two men have clearly been at odds on a long list of subjects such as immigration, the environment, how to fight poverty, using militarization instead of diplomacy, to name a few. Signaling some openness to the pope’s thinking, Trump is said to have uttered, “I won’t forget what you said,” as he left their private session. Cardinal Timothy M. Dolan of New York, in an interview with CNN shortly after the meeting, said he wouldn’t be surprised if the pope got some of his points across to the president. “I mean, this is a man who has come across as the greatest prophet in protection of the poor and vulnerable and marginalized throughout the world. So, that he would speak of those values and principles, I’m sure he did,” Cardinal Dolan said about the pope during CNN’s “New Day” morning show. But others like Massimo Faggioli, a church historian and professor of theology at Villanova University in Philadelphia, said it’s also important to look at what wasn’t officially said.